Spoof Facebook pages like this one popped up in reference to a magazine alleged to have stolen a blogger's article. (CNN) -- Roasted. Burned. Cooked. Pick your favorite cooking pun to describe the treatment Cooks Source, a heretofore little-known food magazine, is getting after reports it lifted a blogger's article and then gave a peevish response when she complained. It was hard Friday to find a corner of the internet where talk about Monica Gaudio and her run-in with the magazine's editor wasn't cropping up. On Wednesday, Gaudio wrote about her discovery on her blog. She said she learned about it when a friend congratulated her for being published on the site. Gaudio responded that she had never heard of it and that the article in question -- which detailed medieval pie recipes -- had been written for her own site. She hunted Cooks Source down and proposed a solution: Donate $130, the equivalent of 10 cents per word, to the Columbia School of Journalism as payment. What really set the internet aflame, however, was the response she said she got from editor Judith Griggs. Gaudio said Griggs wrote her an e-mail that read: "[H]onestly Monica, the Web is considered 'public domain' and you should be happy we just didn't 'lift' your whole article and put someone else's name on it!" "It happens a lot, clearly more than you are aware of, especially on college campuses, and the workplace. "If you took offense and are unhappy, I am sorry, but you as a professional should know that the article we used written by you was in very bad need of editing, and is much better now than was originally." Gaudio said the language that was edited was the medieval-style English used in the recipes. She wrote that Griggs went on to tell her the article is now fit to be used in her portfolio and said, perhaps joking, that because the magazine "put some time into rewrites, you should compensate me!" That's where the internet jumped in. A friend and fellow blogger first wrote about the incident. The story spread further after such influential Twitter users as fantasy writer Neil Gaiman and science-fiction/geek icon Wil Wheaton (combined, the two have a Twitter audience of 3.2 million) shared it with their followers. "PROPOSAL: Mendacity will now be measured on the Cook's Source scale, with individual units known as Cheneys," Wheaton wrote Thursday. The story was "voted up" to the main page of popular news-sharing site Reddit. Another blogger weighed in under the headline, "World's Dumbest Editor Incurs The Wrath Of The Internet." At mid-morning Friday, "Cook's Source" remained one of the most-search topics on Google's "Trends" list. As with virtually every internet phenomenon, Facebook users were chiming in, too. 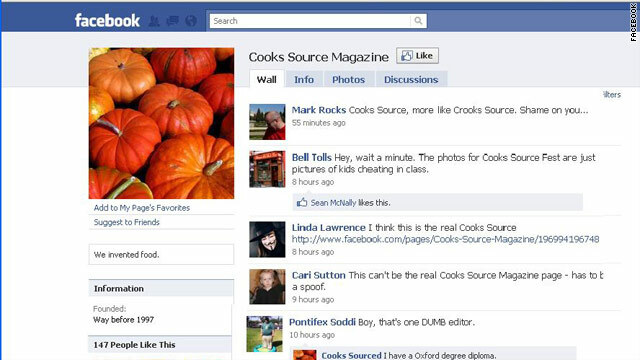 Cooks Source's Facebook page, which had about 3,300 users who "Like" it as of Friday, was covered in story-stealing jokes and insults. "Cooks Source got roasted toasted and burnt to a crisp," one user wrote on the page's wall. "8. Thou Shalt Not Steal - Judith Griggs (there would have been 15 commandments, but Cooks Source took them)," wrote another. A quick-developing meme in the comments saw users blaming Cooks Source for everything from the death of Laura Palmer on "Twin Peaks" to the Kennedy assassination to the inability to get an iPhone on any U.S. network other than AT&T. At least several fake Cooks Source pages had also cropped up to mock the magazine. On Friday, the magazine appeared to have created a new Facebook page. "A new page as the previous one was hacked," read the "Info" section for "Cooks Source Mag." A post cryptically said, "The previous regime has been removed," but did not reference Griggs directly. Later posts seemed to echo Griggs' arguments as quoted by Gaudio. "There's lots of people here that do not seem to understand a few basics yet they seem to all be experts in the print business," read one. Read a later post: "For those that have asked POLITELY, no we will not be stopping the magazine, and yes we will be taking further action against anyone caught hacking." Online foodies were all over the story. A photo on Food Network star and Southern-cooking champion Paula Deen's Facebook page showed what the poster said was one of Deen's recipes used on the site. "Thank you, this has been forwarded to our legal department," replied Deen or, perhaps more likely, a staffer running the account. Deen was one of several high-profile cooks whose articles appear to have been used on the magazine's site. It wasn't the only place that online foodies were sounding off. Some in the culinary community, while not exactly defending Cooks Source, sounded off about the ensuing Web pile-on. "Not saying the Cook's Source editor isn't cretinous, but it's creepy when we get all lynch-mobby over stupid people with limited influence," Michele Humes, a New York food writer, said on her Twitter feed. Griggs has not publicly addressed the controversy, either in interviews or on the magazine's website. Gaudio said Thursday she has heard nothing more from them. The site did not appear to have an active e-mail link or other contact information Friday.